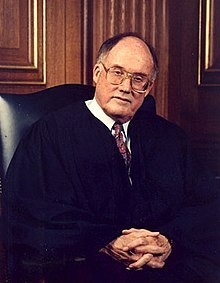 William Hubbs Rehnquist (October 1, 1924 in Milwaukee, Wisconsin – September 3, 2005 in Arlington, Virginia) was an American lawyer, jurist, and a political figure. He was an Associate Justice on the Supreme Court of the United States and later as the Chief Justice of the United States. Considered a conservative, Rehnquist favored a federalism under which the states meaningfully exercised governmental power. Under this view of federalism, the Supreme Court of the United States, for the first time since the 1930s, struck down an Act of Congress as exceeding federal power under the Commerce Clause. William H. Rehnquist (2004). The Centennial Crisis: The Disputed Election of 1876. Knopf Publishing Group. ISBN 0-375-41387-1. William H. Rehnquist (1998). All the Laws but One : Civil Liberties in Wartime. William Morrow & Co. ISBN 0-688-05142-1. William H. Rehnquist (1992). Grand Inquests: The Historic Impeachments of Justice Samuel Chase and President Andrew Johnson. Knopf Publishing Group. ISBN 0-679-44661-3. William H. Rehnquist (1987). The Supreme Court: How It Was, How It Is. William Morrow & Co. ISBN 0-688-05714-4. Revised edition: William H. Rehnquist (2001). The Supreme Court: A new edition of the Chief Justice's classic history. Knopf Publishing Group. ISBN 0-375-40943-2.